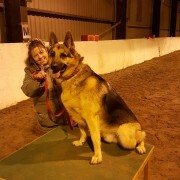 I am a Dog Trainer and behaviourist based in Skegness, Lincolnshire. I currently offer Dog Training in both Private sessions (where I travel to you in your home) and group classes in and around the Skegness area. I specialise in working with Dogs with aggression issues be it aggression towards other dogs or humans or even both. Easily the best trainer in the area. So many local classes are bias toward breed and use training techniques I find unacceptable but not Tasha. She doesn't judge what type of dog you have or what behaviour issues you might be struggling with, all she wants is the best for your animal. 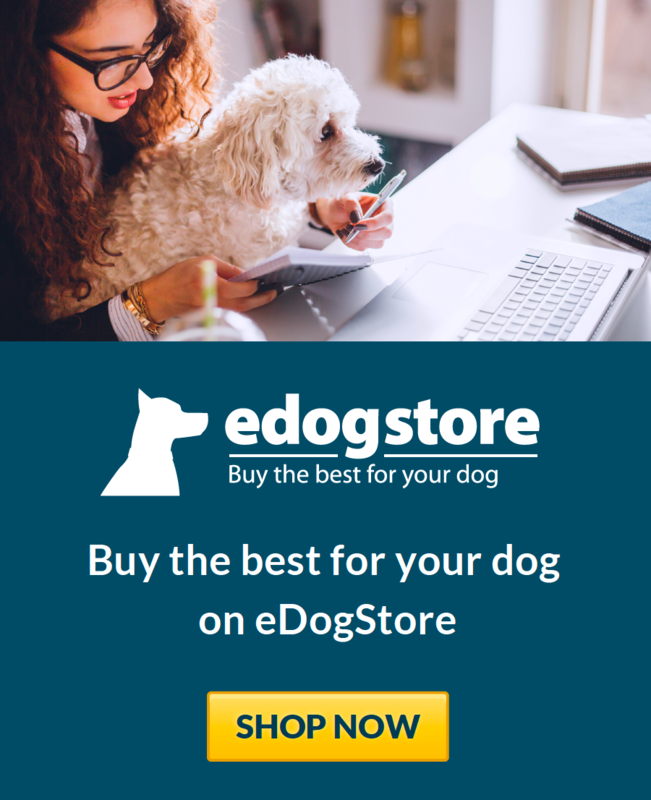 On top of one to one training for the more serious problems us dog owners sometimes face, she also holds seminar days that focus on specific areas of dog behavior. Then there's the weekly training classes for basic obedience and socializing your dogs. So there really is something for everyone. Including agility classes which the dogs just love. She has the knowledge and experience you want from a professional with the compassion and encouragement you could only hope for from a friend. I won't be taking any of my beloved pups anywhere else. Natasha is someone who knows how to train the dog owner aswell as their dog. She offers great support during class and encourages us humans to put in the hard work reinforcing what has been learnt in class by doing our homework! Miyagi's training has help me very much with my dog. Rusty was reactive to dogs and humans. When I first started with Tasha, he had to have a muzzle. He wasn't friendly at all to anyone. After having one to one training rusty is now without his muzzle and will walk off lead, and will greet other dogs on the beach without showing any aggression. He is still nervous of humans, so that is still work in progress. But with Tasha's help I am confident he will improve. I would highly recommend. Tasha is patient , great with all dogs and works with you 100%. Brilliant trainer, working with my reactive Romanian rescue dog and before 5is Tasha worked with my labrador Buster before he sadly passed away. Would never use anyone else. We had a few little problems with our dogs that made one big problem Tasha helped us sort out the little problems in a short period of time. It didn't happen over night but by doing the homework she set us we now have calm dogs. Woking with Tasha is like woking with a friend, although she is very professional. We have been using Miyagi's Dog Training services for the last 4 months, and couldn't be happier with the help and support Tasha has continually provided. She has taken our unsocialised, hyperactive puppy and helped transform her into the loving family pet we dreamt of having. Tasha always goes above and beyond in helping us and our dog, and any issues or worries we have are quickly resolved. Her one-to-one sessions are invaluable, as are her group training sessions each Tuesday. Tasha also provides friendly and positive advice regarding nutrition and behavioural matters, which is backed by her numerous awards and qualifications. We have a German Shepherd with an attitude who does not like strangers or anyone coming to our door. We had tried a few dog trainers before... the less said about them the better! Tasha believed in Harry straight away and could read him like a book. By the third visit he was in love with her and ran into her arms at each visit. We learned a lot about about dogs over the next few months and then felt brave enough to start taking Harry out to public places with Tasha. He has improved so much since we found Tasha. If you're looking for a dog trainer who is down to earth and understands dogs this is your lady. 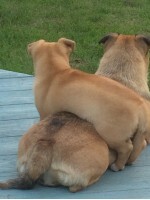 From Charley being a puppy we have had tremendous support and guidance from Tasha. 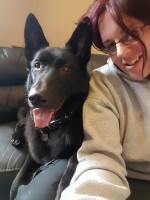 Charley was very nervous and has since made significant progress with obedience and confidence and now enjoys attending Agilty socialising and having fun. Tasha has worked with our pup as soon as she was able too with her injections. She’s taught us all ways to train our pup along with giving us fun classes and workshops and working close with us all to gain a good bond. Our dog (Ruby) has come on heaps and bounds and also took up agility training which she loves! 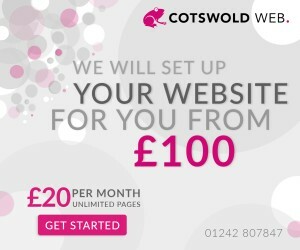 Tasha is always at the end of the phone if needed, could t recommend anyone better. Tasha worked with our fear reactive German Shepherd. 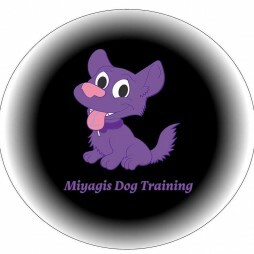 I wouldn’t hesitate to recommend Miyagis, she knows dogs, inside and out. 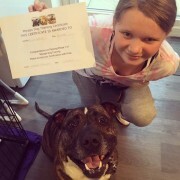 She is continually adding certificates to her never ending education on dogs. 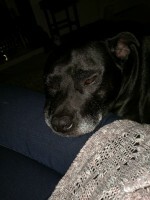 Tasha has been working with us with the dogs in our house, who are reactive with each other. We have made great progress in a short amount of time and it is all thanks to Tasha's guidance. Before Tasha we were at end of our tether we had four trainers before we met Tasha. Tasha is the only trainer who has been able to make progress with Simba we even tried board and train to no avail. Even though it came highly rated. We heard bout Tasha from a friend and the changes with Simba have been amazing. When we called Tasha we had been visited by the police concerning our dog as he had a scuffle with the dogs next door. Tasha has been able to do obedience with Simba, recall him, walk him, train us, get him close to other dogs Ben though he is closely managed and none of this had happened before, we have never lost Simba with Tasha whereas we did with other trainers when we explain he has no recall, he is a rescue from the Ark and from what we know he has had a really bad start. He's not aggressive but nervous reactive and Tasha has taught us this, helped us with his food and allergies and helped us to become more confident with him, we still have a long way to go until we are fully comfortable with managing Simba alone but the changes in Simba have been amazing. Best thing we ever did getting Tasha in our Dogs are now amazing . She came highly recommended and we know why! Tasha has helped so much with my pup, he loves the obedience classes and the agility which are both very friendly, fun and informative. She has endless patience with all the dogs, she is a real dog-lover.